Here is the list of the hotels near Taponnat-Fleurignac. Book your hotel near Taponnat-Fleurignac today, Thursday 16 May for the best price, reservation and cancellation free of charge thanks to our partner Booking.com, leader in on-line hotels reservation. Below here is the list the 50 closest hotels of Taponnat-Fleurignac, sortable according your criteria. You will find the position of these accommodations on the Taponnat-Fleurignac hotels map. Auberivieres is a 2-star property situated in La Rochefoucauld. This 2-star hotel features free WiFi and a terrace. At the hotel, all rooms are fitted with a wardrobe. All rooms are equipped with a private bathroom. The rooms in Auberivieres are equipped with a flat-screen TV and free toiletries. Angoulême is 25 km from the accommodation. The nearest airport is Limoges International Airport, 75 km from the property. Offering a children's playground, La Maison Du Pompinaud is a 19th-century building situated in 4 hectares of grounds in Yvrac-et-Malleyrand, 8 km from Rochefoucauld castle. Free WiFi is offered and free private parking is available on site. Every room is fitted with a private bathroom. A continental breakfast is included in the price. Homemade meals can be prepared upon prior reservation and for an extra fee. You will find a shared living room and a covered terrace at the property. Upon request and availability, the hosts can organise a visit of their farm. Guests' horses can be accommodated at an extra cost. The area is popular for hiking, kayaking and horse riding. Angoulême is 31 km from La Maison Du Pompinaud, while Cassinomagus Archaeological Park is 37 km from the property. Lacs de Haute Charente amusement park is 22 km away. The nearest airport is Limoges International Airport, 75 km from La Maison Du Pompinaud. Bed and Breakfast Chasseneuil-sur-Bonnieure Preferred hotel ! Moulin du Fontcourt is a renovated watermil located in the historic town of Chasseneuil sur Bonnieure. It features large, well kept gardens in a riverside and countryside setting. The property offers free, on site parking and free WiFi. All the Moulin du Fontcourt's guest rooms feature Charente stone walls, beams and lofted ceilings, and enjoy views of the river, gardens and countryside. They include linens/towels, toiletries, hair dryers, safety deposit boxes, tea/coffee making facilities and access to the guest lounge. A continental breakfast consisting of cereals, yogurts, grapefruit, croissants, baguette, juice, tea/coffee and is served on the terrace, or in the dining room. Chasseneuil SNCF rail station, the tourist office, bars, shops and restaurants can be found within 1 km. Fishing, golf, horse riding, cycling and water sports can be enjoyed in the surroundings. Angoulême is a 20-minute drive from Moulin du Fontcourt, and Cognac and Limoges are both an hour's drive away. Bed and Breakfast Yvrac-et-Malleyrand Preferred hotel ! La maison d'Antoine is set in Yvrac-et-Malleyrand, 6 km from La Rochefoucauld, 26 km from Angoulême and 46 km from Brantôme. Free private parking is available on site. The room is set in a park, in a separate annex on ground floor. It offers a seating area where you can relax. You will find a kettle in the room. The room is fitted with a private bathroom equipped with a shower. La maison d'Antoine features free WiFi throughout the property. Guests have access to a wooden terrace equipped with outdoor seating area and hammocks. The nearest airport is Limoges International Airport, 58 km from La maison d'Antoine. Le clos des cèdres in La Rochefoucauld features a tennis court and a spa & wellness centre. The property has barbecue facilities and a garden. Both free WiFi and private parking are available. At le clos des cèdres, all rooms have a desk. Each room is equipped with a private bathroom, while selected rooms have a garden view. The units will provide guests with a wardrobe and a kettle. The daily breakfast offers continental and buffet options. Upon request, italian homemade evening meals can be served. Le clos des cèdres offers a terrace. Cycling is among the activities that guests can enjoy near le clos des cèdres. Staff at reception can provide assistance around the clock with advice on the area. Angoulême is 20 km from le clos des cèdres. Limoges International Airport is 63 km away. Set in Malleyrand, Tendance Campagne features accommodation with free WiFi and a seasonal outdoor swimming pool. All units comprise a seating area, and a fully equipped kitchen with various cooking facilities, including an oven, a microwave, a toaster and a fridge. There is a fully equipped private bathroom with shower and free toiletries. Continental and buffet breakfast options are available each morning at the bed and breakfast. The restaurant at Tendance Campagne specialises in French cuisine. The accommodation offers a barbecue. A children's playground is available for guests to use at Tendance Campagne. Angoulême is 32 km from the bed and breakfast. Limoges International Airport is 82 km away. Situated in Saint-Projet-Saint-Constant, Chez Jumaine offers accommodation with free WiFi. There is a fully equipped private bathroom with shower and a hair dryer. A continental breakfast can be enjoyed at the property. The bed and breakfast offers a sun terrace. Angoulême is 22 km from Chez Jumaine. The nearest airport is Limoges International Airport, 78 km from the property. Guest accommodation Saint-Sornin Preferred hotel ! Located in Saint-Sornin in the Poitou-Charentes region, Gite - Le chemin blanc features a garden. It features free WiFi and free bikes. The holiday home has 1 bedroom, a flat-screen TV, an equipped kitchen with an oven and a microwave, and 1 bathroom with a shower. A continental breakfast is available each morning at the property. The holiday home offers an outdoor pool. This property offers a barbecue and a terrace. Angoulême is 29 km from Gite - Le chemin blanc. The nearest airport is Limoges International Airport, 81 km from the accommodation. Guest accommodation Montembœuf Preferred hotel ! Set in Montembœuf in the Poitou-Charentes region, La Bucherie offers accommodation with free WiFi. Each unit is fully fitted with a washing machine, a flat-screen TV, a sofa and wardrobe, as well as a fireplace. A balcony with view is available in one of the units. The holiday home offers an outdoor pool. BBQ facilities can be found at La Bucherie, along with a sun terrace. Angoulême is 32 km from the accommodation, while Brantôme is 48 km from the property. The nearest airport is Limoges International Airport, 51 km from the property. With a seasonal outdoor swimming pool and a garden, Gites les Lignons is set in Champniers and features free WiFi. All of the units feature a private bathroom, flat-screen TV, fully-equipped kitchen and terrace. A microwave and toaster are also featured, as well as a coffee machine and a kettle. Guests at the holiday home can enjoy a continental breakfast. Angoulême is 17 km from Gites les Lignons. The nearest airport is Limoges International Airport, 83 km from the accommodation. Located in Montembœuf, Limetree House features accommodation with access to a garden. Free WiFi is featured. A continental breakfast is available daily at the bed and breakfast. Limetree House offers a terrace. A bicycle rental service is available at the accommodation. Angoulême is 46 km from Limetree House. Limoges International Airport is 65 km from the property. Holiday home Ferme De L'Alba M-770 is situated in Chichiat. Guests may enjoy free WiFi. Private parking is available at the holiday home. Holiday home Ferme De L'Alba M-770 offers an outdoor pool. Angoulême is 42 km from the accommodation. The nearest airport is Limoges International Airport, 59 km from the property. Le Relais de l’Age is located in Suaux, a 30-minute drive from Angoulême in the Poitou-Charentes region. The guest house proposes free Wi-Fi access and a 5000-m² garden with an outdoor swimming pool. The guest rooms at Le Relais de l’Age are individually decorated and include a wardrobe. They each have a bathroom with a bathtub or a shower. A continental breakfast can be enjoyed every morning at Le Relais de l’Age and French restaurants are found within 8 km from the property. Guests are free to play table tennis on site. Free private parking is possible on site and Chasseneuil-sur-Bonnieure Train Station is 9 km away. The property is a 1-hour drive from Limoges and 28 km from Rochechouart. 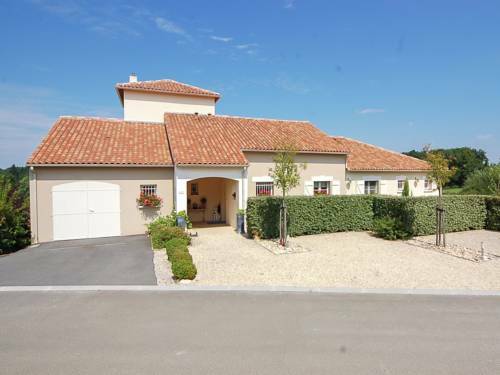 Located in Saint-Angeau in the Poitou-Charentes region, Les Quatre Saisons features a terrace. The accommodation has free WiFi. This holiday home comes with a fully equipped kitchen, a dining area and a flat-screen TV. Angoulême is 31 km from the holiday home. The nearest airport is Limoges International Airport, 81 km from Les Quatre Saisons. Located just 2 km from Pranzac, Gîtes Logis de Flamenac offers traditional cottages with stone walls set in a former 15th-Century sheep farm. They have a furnished patio, BBQ facilities and are situated within 3-hectares of field. All cottages feature 2 or 3 bedrooms, a living area with a flat-screen TV, washing machine and bathroom. The kitchen is equipped with a dishwasher, oven and refrigerator. Angoulême is only a 30-minute drive away and shops, restaurants and bars can be found in the centre. La Rochefoucauld is a 15-minute drive away and free private parking is possible on site. B&B Saint Nicolas Chambre d'Hotes features accommodation with a garden and free WiFi. Continental and buffet breakfast options are available daily at the bed and breakfast. B&B Saint Nicolas Chambre d'Hotes offers a terrace. A bicycle rental service is available at this property. Angoulême is 49 km from the accommodation. The nearest airport is Limoges International Airport, 69 km from the property. Offering free WiFi and garden views, Le Bourg is an accommodation situated in Cellefrouin. Guests staying at this holiday home have access to a fully equipped kitchen. The holiday home has a satellite flat-screen TV and 1 bedroom. The property also has 1 bathroom is fitted with a shower. Angoulême is 49 km from the holiday home. The nearest airport is Limoges International Airport, 69 km from Le Bourg. Bed and Breakfast Vouthon Preferred hotel ! Situated in Vouthon, 23 km from Angoulême, Le Clos de la Font Queroy boasts a seasonal outdoor pool and barbecue. Guests can enjoy the on-site bar. Free private parking is available on site. Some units include a private bathroom with a spa bath, while others have bathrobes and free toiletries. You will find a kettle in the room. Le Clos de la Font Queroy features free WiFi throughout the property. There is a shared lounge at the property. Upon prior request, guests can enjoy dinner made with fresh, seasonal products. A selection of activities are offered in the area, such as golfing and horse riding. Featuring free WiFi and a terrace, Dashnieuil offers accommodation in Nieuil. Free private parking is available on site. There is also secure parking for motorcycles and bicycles. You will find a kettle, tea and coffee, as well as a fridge just outside the room. A hairdryer is provided in the bathroom. There is a shared lounge at the property. The nearest airport is Limoges International Airport, 53 km from Dashnieuil. Set in Nieuil, 38 km from Angoulême, Maison Des Fleurs boasts a barbecue and views of the garden. Free private parking is available on site. The rooms have a TV with satellite channels. Certain rooms include a seating area to relax in after a busy day. You will find a coffee machine in the room. Extras include free toiletries and a hairdryer. Maison Des Fleurs features free WiFi throughout the property. There is a shared lounge at the property. Evening meals can be served upon request at an extra cost. The nearest airport is Limoges International Airport, 51 km from Maison Des Fleurs. Les Bruyères is located in Montbron and offers a seasonal outdoor swimming pool. The holiday home features garden views and is 36 km from Angoulême. The holiday home is located on the ground floor and is fitted with 2 bedrooms, a flat-screen TV and a fully equipped kitchen that provides guests with a dishwasher. The holiday home offers a barbecue. Guests can relax in the garden at the property. Brantôme is 48 km from Les Bruyères. The nearest airport is Limoges International Airport, 88 km from the property. Offering an outdoor swimming pool and an à la carte restaurant, Domaine Brise Bois is located in Rouzède. Free Wi-Fi access is available, as well as a children’s playground and a laundry. At Domaine Brise Bois, the garden-view bedrooms have a flat-screen TV, DVD player, satellite channels and a minibar. Complete with a refrigerator, the dining area also has an electric kettle and a coffee machine. Featuring a shower, the private bathrooms also come with a hairdryer and towels. An array of activities can be enjoyed on site or in the surroundings, including cycling, billiards and table tennis. There is free parking nearby. Apartment Mazières Preferred hotel ! Domaine Charente - Familyroom Gypsy with garden (with external toilet & shower house) is situated in Mazières and offers a seasonal outdoor swimming pool. Boasting garden views and a garden, this apartment also offers free WiFi. Guests at the apartment can enjoy a continental breakfast. Speaking German, English and French at the reception, staff are always on hand to help. Domaine Charente - Familyroom Gypsy with garden (with external toilet & shower house) offers a barbecue. There is a terrace at this property and guests can go fishing nearby. Angoulême is 48 km from the accommodation. The nearest airport is Limoges International Airport, 56 km from the property. Bed and Breakfast Mazières Preferred hotel ! Offering a seasonal outdoor pool, barbecue and sun terrace, Domaine Charente - B&B Le Jardin is set in Mazières in the Poitou-Charentes Region, 38 km from Angoulême. The spacious bedrooms come with a sitting area, a large bed and a fridge. The bathroom offers a shower and toilet and are located in the garden. Breakfast can be served on the terrace, the garden, or in the comfort of your room. Evening meals are also available at an extra cost. A selection of activities are offered in the area, such as golfing, cycling and canoeing. The nearest airport is Limoges International Airport, 47 km from Domaine Charente - B&B Le Jardin. Situated in Mazières in the Poitou-Charentes region, Domaine Charente - Cottage Charente features a terrace and mountain views. This property offers access to ping-pong. This air-conditioned holiday home features 2 bedrooms and 1 bathroom equipped with a bidet and free toiletries. The kitchen is equipped with an oven and a toaster, as well as coffee machine. A continental breakfast is served daily at the property. Languages spoken at the 24-hour front desk include German and English. The holiday home offers an outdoor pool. A children's playground is also available for guests at the property. Angoulême is 48 km from Domaine Charente. The nearest airport is Limoges International Airport, 56 km from the property. Featuring a seasonal outdoor pool and private garden, this holiday home is situated in Mazières, 43 km from Angoulême. Free WiFi is available throughout the property. There is also room service at the property. A number of activities are offered in the area, such as golfing and cycling. The nearest airport is Limoges International Airport, 55 km from the property. Hotel The Originals Château de Nieuil (ex Relais du Silence) is a former François the First's hunting manor. It is located between Cognac and Limoges, a lovely region where you will have a peaceful moment. It offers 7 bedrooms and 3 suites. Each is unique, given its character by furnishings in differing styles, ranging from Louis XIII to the Thirties, all chosen with care. There is a wide range of sport activities available on the estate: swimming pool, tennis, cycling, and fishing for the more energetic. The "Grange aux Oies", a charming inn opposite the château, and the art gallery will add to your enjoyment. Bed and Breakfast Chazelles Preferred hotel ! Set in Chazelles, Le Coin de Jeammet offers accommodation with a terrace. Free WiFi is offered. Each unit is equipped with a patio, a satellite flat-screen TV, a seating area, a well-fitted kitchen and a shared bathroom with shower, free toiletries and a hair dryer. A continental breakfast is served every morning at the property. The bed and breakfast offers an outdoor pool. Barbecue facilities are included and guests can also relax in the shared lounge area. Angoulême is 21 km from Le Coin de Jeammet, while Brantôme is 49 km from the property. The nearest airport is Limoges International Airport, 88 km from the property. Located in Montbron, Leonat features a private pool and free WiFi. The accommodation is 33 km from Angoulême. The villa features 3 bedrooms, a TV and a fully equipped kitchen that provides guests with a dishwasher and an oven. The villa offers an outdoor pool. A garden and a barbecue are offered at the property. Brantôme is 49 km from Leonat Montbron. Limoges International Airport is 77 km away. Le Maine Sougouse is set in Saint-Germain-de-Montbron. Guests at the bed and breakfast can enjoy a continental breakfast. Guests can also relax in the garden. Angoulême is 25 km from le Maine Sougouse, while Brantôme is 47 km away. The nearest airport is Limoges International Airport, 89 km from the property. Located near Genouillac, this holiday home features a seasonal outdoor pool and free WiFi. Guests benefit from a furnished terrace with barbecue facilities. Free private parking is available on site. The bedroom is set on a mezzanine and there is a bathroom. The kitchenette comes with a microwave, toaster, oven, fridge and washing machine, as well as a dishwasher. A flat-screen TV with French and UK channels, and a DVD player are offered. Set in Mouzon, Four-Bedroom Holiday home Mouzon with a Fireplace 04 offers accommodation with a private pool and private parking. Guests staying at this holiday home have access to a fully equipped kitchen. The property includes a living room with a TV. The holiday home offers an outdoor pool. Angoulême is 48 km from Four-Bedroom Holiday home Mouzon with a Fireplace 04. Limoges International Airport is 56 km away. Situated in Rouzède, La Prèze 16 offers accommodation with a private pool and free WiFi. Guests staying at this villa have access to a terrace. The villa includes 3 bedrooms, a kitchen with a dishwasher and an oven, as well as a coffee machine. A TV is available. The villa offers a barbecue. A water sports facilities is available on site and horse riding can be enjoyed within close proximity of La Prèze 16. Angoulême is 48 km from the accommodation. The nearest airport is Limoges International Airport, 66 km from the property. Set in Roussines, La Prèze features accommodation with a private pool. This villa offers water sports facilities, a tennis court, as well as barbecue facilities. The villa has 4 bedrooms, a TV and a fully equipped kitchen that provides guests with a dishwasher, an oven, and a washing machine. The villa offers an outdoor pool. La Prèze provides a terrace. Angoulême is 47 km from the accommodation. The nearest airport is Limoges International Airport, 66 km from La Prèze. Boasting accommodation with a private pool, La Prèze 12 is located in La Séguinie. Guests may enjoy free WiFi. Leading onto a terrace, the villa consists of a fully equipped kitchen and a TV. The villa offers a barbecue. Water sports facilities can be found at the property, along with a garden. Angoulême is 47 km from La Prèze 12. The nearest airport is Limoges International Airport, 65 km from the accommodation. Set in Roussines, Villa La Preze 10 provides a private pool. This property offers access to free WiFi. The villa features a TV and 3 bedrooms. A dishwasher and an oven can be found in the kitchen. The villa offers an outdoor pool. A barbecue can be found at Villa La Preze 10, along with a terrace. Angoulême is 47 km from the accommodation. The nearest airport is Limoges International Airport, 65 km from the property. Featuring barbecue facilities, Les Pierrottes features accommodation in Mornac with free WiFi and garden views. Guests benefit from a terrace and a children's playground. The holiday home has 4 bedrooms, a flat-screen TV with satellite channels, an equipped kitchen with a dishwasher and an oven, a washing machine, and 2 bathrooms with a bath. Angoulême is 13 km from the holiday home. The nearest airport is Limoges International Airport, 89 km from the property. Chambres des Forges provides accommodation with a garden and free WiFi. Guests at the bed and breakfast can enjoy a continental breakfast. Chambres des Forges offers a terrace. If you would like to discover the area, hiking is possible in the surroundings. Angoulême is 41 km from the accommodation. Limoges International Airport is 73 km from the property. Villa La Haute Prèze 29 Près De La Dordogne is set in Rouzède. This villa features a private pool and a garden. The villa includes a kitchen with a dishwasher and an oven, as well as a coffee machine. A TV is provided. The villa offers a barbecue. Villa La Haute Prèze 29 Près De La Dordogne conveniently has both water sports facilities and a terrace. Angoulême is 47 km from the accommodation. The nearest airport is Limoges International Airport, 65 km from the property. Village Le Chat is a detached holiday home situated in Écuras. Guests benefit from free WiFi and private parking available on site. A dishwasher, an oven and a microwave can be found in the kitchenette. A flat-screen TV is provided. Other facilities at Village Le Chat include a seasonal outdoor pool. You can play tennis and mini-golf at the property, and bike hire is available. Angoulême is 34 km from Village Le Chat, while Brantôme is 39 km from the property. Limoges International Airport is 50 km away. There is an 18-hole championship golf course, golf driving range, 9-hole par 3 course, practice facilities, clubhouse, restaurant and bar within walking distance of the accommodation. Villa La Haute Preze 47 I is set in Roussines and offers water sports facilities. Complimentary WiFi is offered. The 4-bedroom villa is fitted with a living room with TV, and a fully equipped kitchen. The villa offers a barbecue. A terrace is available on site and horse riding can be enjoyed within close proximity of Villa La Haute Preze 47 I. Angoulême is 47 km from the accommodation. Limoges International Airport is 65 km from the property. Set in Roussines, Villa La Haute Preze 47 offers a private pool and free WiFi. Guests benefit from a terrace and a barbecue. The villa includes 6 bedrooms and a kitchen with a dishwasher and an oven. A TV is provided. Water sports facilities is available on site. Angoulême is 47 km from the villa. The nearest airport is Limoges International Airport, 65 km from Villa La Haute Preze 47. Villa La Preze 36 is set in Écuras and offers water sports facilities. Complimentary WiFi is available. This villa is fitted with 3 bedrooms, a TV, and a kitchen with a dishwasher and an oven. The villa offers an outdoor pool. Guests at this property can enjoy horse riding nearby, or make the most of the garden. Angoulême is 47 km from Villa La Preze 36. Limoges International Airport is 65 km from the property. Holiday Home Le Coussot is situated in Beaulieu-sur-Sonnette. Guests staying at this holiday home have access to a fully equipped kitchen. The holiday home is fitted with a TV, 2 bedrooms and a living room. Limoges International Airport is 75 km from the property. Situated in Écuras, 18 Village Le Chat is a holiday home featuring a seasonal outdoor pool. Guests benefit from terrace. The kitchen comes with an oven. Towels and bed linen are offered at 18 Village Le Chat. Other facilities at 18 Village Le Chat include a terrace. You can play tennis, billiards and mini golf at the property, and the area is popular for golfing. Angoulême is 34 km from 18 Village Le Chat, while Brantôme is 38 km from the property. You can engage in various activities, such as fishing and canoeing. Set in Rouzède, Villa La Haute Prèze 34 Prè De La Dordogne provides a private pool. This property offers access to free WiFi. Opening onto a terrace, the villa consists of 3 bedrooms. A TV and DVD player are offered. The villa offers a barbecue. Guests can relax in the garden at the property. Angoulême is 47 km from Villa La Haute Prèze 34 Prè De La Dordogne. The nearest airport is Limoges International Airport, 65 km from the accommodation. Located in Écuras in the Poitou-Charentes region, Holiday House Dordogne/Charentes has a terrace and lake views. The property features garden views and is 46 km from Angoulême. The holiday home features a satellite flat-screen TV, 3 bedrooms and a living room. The kitchen comes with a dishwasher. The holiday home offers a barbecue. A water park can be found at the property, along with a garden. The nearest airport is Limoges International Airport, 71 km from the property. Le Chat 116 is situated in Écuras and offers water sports facilities, a tennis court and barbecue facilities. Guests have access to free WiFi. The villa includes 3 bedrooms and a kitchen with a dishwasher and an oven. A TV is available. The villa offers a children's playground. A terrace is available on site and horse riding can be enjoyed within close proximity of the property. Angoulême is 46 km from Le Chat 116. Limoges International Airport is 71 km away. Holiday Home Massignac with Fireplace I is situated in Massignac. Complimentary WiFi is offered. This holiday home comes with a living room and a fully equipped kitchen with a dishwasher and a microwave. A TV and a DVD player are provided. Angoulême is 46 km from the holiday home. The nearest airport is Limoges International Airport, 57 km from the property. Village Le Chat is a holiday park located in Charente. Set in an 81-acre park, the property offers outdoor heated swimming pools, tennis courts, a children’s playground and a large pond. Village Le Chat features bungalows with views of the countryside, a seating area, a TV and a DVD player. They also come with a private bathroom with a bath tub or a shower. There guests will enjoy a fully equipped kitchen with kitchenware, a coffee machine and an electric kettle. On site, they can enjoy their meals on the terrace of the village's restaurant. Village Le Chat also has a laundry and barbecue facilities. An array of activities can be enjoyed on site, such as cycling and hiking. Angouleme Train Station is 35 km from this property which offers free parking. Below here is the hotels map of Taponnat-Fleurignac. Names and details of Taponnat-Fleurignac hotels can be shown on the map clicking on the prices icons.